The fully revised, restructured and updated second edition of the ICE Manual of Bridge Engineering has been written and edited by a team of leading experts and presents valuable contributions from across the field within a single resource. The second edition comprehensively addresses key topic within bridge engineering, from history and aesthetics to design, construction and maintenance issues. 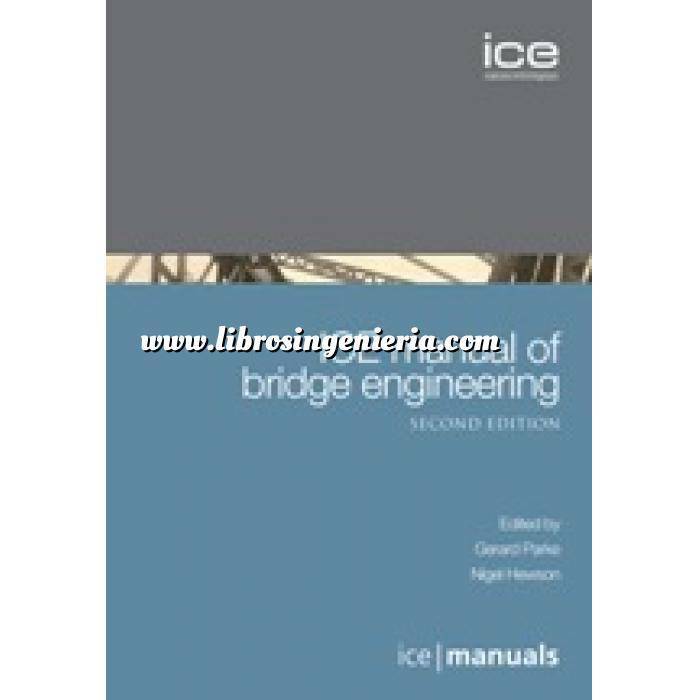 ICE Manual of Bridge Engineering, second edition is the authoritative point of reference for practising civil and structural engineers in consulting firms and government agencies, bridge contractors, research institutes, universities and colleges – in short, all practitioners involved in any aspect of the analysis, design, construction, repair, maintenance, and refurbishment of bridges. The ICE manuals series will offer civil engineers the quickest route to the information they need, ultimately providing core knowledge for the profession within a single highly referenced resource. ICE manuals will be available both in print and online and will deliver a comprehensive, authoritative and accessible package for all those working in civil engineering. This chapter on the history and aesthetic development of bridges looks at the evolution and progress of bridges from their earliest conception by humans. Following a timeframe from the Palaeolithic period to the present all the various materials employed in construction are examined in relation bridge development. Aesthetic design in bridges – especially in the twentieth century is looked at in detail and the chapter ends with an essay on the search for aesthetic understanding in bridge design. This chapter deals primarily with the intensity and application of the transient live loads on bridge structures according to American, European and British international codes of practice, and gives some guidance on how to calculate them. The predominant live loading is due to the mass of traffic using the bridge, and some time has been spent on the history of the development of such loads because for example, one might ask ‘what vehicle (or part of a vehicle) can possibly be represented as a knife edge load (KEL)? A steam roller perhaps! Without the historical background knowledge, it is blindly assumed to be apposite, and the poor designer is left annoyed and frustrated. All of the remaining loads are shown in Figure 1. Once the primary traffic loads have been established, then consideration is given to secondary loads emanating from the horizontal movement of the traffic and then the permanent, environmental and construction loads are evaluated. Finally, guidance is given on the use of influence lines to determine the bending moments in continuous multi-span bridges; and some examples on determining the distribution of temperature, shrinkage and creep stresses and deformation in bridge decks, and the use of time-saving distribution methods for determining the stress resultants in single span bridge decks. Most bridge engineers rarely undertake any form of dynamic analysis, but instead rely on codified pseudo-static load factors and semi-empirical rules to ensure satisfactory dynamic structural response. As bridge engineers and architects employ ever more innovative structural forms and use of materials there is increasing need to understand and control dynamic response. Irrespective of this trend it is useful for every practising bridge engineer to understand the fundamental concepts behind dynamics and to be aware of the analysis methodologies that are available. This chapter is a practical guide containing sufficient theory to provide grounding in the subject, supplemented with plenty of practical insights and recommendations for the practising engineer. There is a wealth of good literature on the subject and it is not the intent of the chapter to repeat this material but to put it into a readily digestible context that will appeal to the reader. Extensive references to more detailed texts are provided. All bridges have foundations and abutments, while most have piers, columns, pylons or towers which where they are located below the deck level are collectively known as the substructure. The wide variety of substructures commonly used range from piled to spread footing, bankseats to embedded abutments, cantilevering piers to fully integral structures. Substructures also bring together structural and geotechnical engineering interacting to support the rest of the bridge. To do justice to all aspects of substructure would require a much lengthier script than we have room for here, but this chapter endeavours to introduce the basic principles in scheming up, designing and constructing the substructure for a bridge. Guidance is given on selecting suitable structural arrangements for the foundations, abutments and piers along with the geotechnical parameters used in their design. The shortest span reinforced concrete decks are built as solid slabs. These may be supported on bearings although, due to durability issues with expansion joints and bearings, it is usually preferable to cast them integral with in-situ abutments or place them as part of pre cast box culverts. As the span increases, the optimum form of construction changes to voided slab or beam and slab then box girder bridges. Open spandrel arches enable relatively long spans, more commonly built in steel or prestressed concrete, to be built efficiently in reinforced concrete. Reinforced concrete is also used for deck slabs and substructures for bridges with main elements of steel or prestressed concrete. The key design criteria and checks required by codes are the same regardless of the form of construction. These are for ultimate strength in flexure, shear and torsion and for serviceability issues including crack widths and service stresses. For elements with significant live load ratios, reinforcement fatigue may sometimes also have to be checked. This chapter provides coverage on all aspects of the design and construction of prestressed concrete bridges, from the fundamentals of prestressing and the equipment used, to insight into the problems that can occur and how they have been dealt with in different projects around the world. It explains key issues for the designer to consider and provides guidance to the site engineer on some of the techniques and temporary works used in their construction. Simple in situ and precast beam bridges are described along with the more advanced techniques of precast segmental and incrementally launched decks. Both pretensioning and post-tensioning are included as well as precast and in situ construction. Recent developments in the use of non-metallic materials to improve the durability of prestressing systems and higher strength concrete are included to show how prestressed concrete bridges are likely to develop in the future. Steel has been used extensively over the last 100 years to construct a large majority of the world's greatest bridges. This chapter, on the design of steel bridges, gives an introduction to the different types of steel bridges in use, followed by guidance on the behaviour of steel plates loaded in both shear and compression. Careful attention is given to assist understanding of the load displacement behaviour of stiffened plates, which are the fundamental components of both plate girders and box girders. Steel plate girders are used extensively in the construction of medium span bridges and steel box girders form the decks of all modern, innovative suspension bridges. The behaviour and design of bolted and welded connections is also included in this chapter, along with guidance on the fatigue appraisal of steel bridges. This chapter outlines the use of composite construction, the combining of materials such as steel and concrete in a bridge structure. Composite construction often allows more efficient structures to be conceived than could be achieved by using either steel or concrete on their own. Each material can be used to advantage, concrete in compression areas avoiding buckling problems common in steel, steel in tension areas avoiding cracking issues associated with concrete. The chapter outlines the common forms of composite bridges and outlines the key factors governing their design, particularly at the important material interfaces. This chapter considers the full range of arch bridge types and a range of materials presenting several case studies and describing the design decisions that were made. A general treatment of the analysis of arches is presented, including the derivation of the basic equations that can be used to undertake hand calculations which may be used to validate computer analysis output. Detailed arch bridge design is outside the scope of this chapter so only general issues are discussed. Most of the chapter is devoted to masonry arch bridges. Masonry arch bridge construction is discussed in its historical context and the importance for engineers to take a holistic approach to bridge assessment and design is emphasised. There is a significant section on bridge assessment which includes guidance in the application of current and emerging assessment methods. This is underpinned with background information regarding the material properties of masonry. The chapter concludes with a treatment of repair and maintenance strategies including a comprehensive table which considers common remedial and strengthening measures. Understanding the unique characteristics of aluminium alloys and exploiting them in ways developed by other industries can produce light, durable and cost-effective bridges. Adopting the concept of placing material where it will be most efficiently used can be described as design in its purest form. Following a brief history of cable stayed bridges this chapter describes the various materials and forms of construction that have been adopted for the major structural components of these bridges, focussing in turn on the cable system, the pylon and the deck. By the use of examples the most appropriate use of these materials and component forms is discussed. A step-by-step approach is given for the preliminary design of the cable stayed bridge from outline proportions of the structure to the static and dynamic analysis including requirements for erection calculations and wind loading on stays. The dynamic behaviour for the cable stayed bridge includes the phenomenon of stay oscillation, which is reviewed in detail including discussion of the various types of dynamic cable response together with the available preventative measures. This chapter provides a summary of the principal requirements for the design and construction of gravity anchored suspension bridges with a classical three span layout. After a brief historical introduction, available types of structural cable are described. The analysis and characteristics of suspended cables is then considered, both when acting in isolation and in conjunction with the suspended structure and towers of a complete structure. The requirements governing the overall layout and detailed design of the main cables, suspended structure, hangers, main towers, cable saddles, and anchorages are then described. After consideration of the critical role of aerodynamics in the design of these bridges, construction methods are discussed, with particular reference to those for the main cables (spinning, compaction, and wrapping for corrosion protection) that are unique to suspension bridges. This chapter is an elementary introduction to movable bridge engineering. Movable bridges are classified and various types are described and illustrated with examples built in the United Kingdom, Europe, and America. Span drive and stabilising machinery is treated and the interdependency between the superstructure, mechanical and hydraulic machinery, and electrical controls is emphasised. A movable bridge is a machine and, as such, dynamic effects should be considered. Major design issues, including safety and redundancy, are discussed as well as design specifications and future trends in the architecture and engineering of movable bridges. Footbridges' design is presented as a special case of bridge engineering and as an opportunity for close collaboration between architects and engineers. The range of structural form and materials used in construction is wide and the parameters employed to generate a design and then assess its success are discussed. Footbridge types are loosely classified and the characteristics of the most common components examined. The principles of setting out are described and extended to considerations of context. Detailing and maintenance regimes are identified as critical concerns. The importance of finishes is highlighted. Structural dimensions and aesthetic principles are treated together. It is concluded that future developments will include innovation in materials, construction processes and most importantly design techniques and the critical analysis of completed works. Ten case studies provide specific examples of general principles. This chapter will introduce the polymers, fibres and advanced polymer composites used in bridge engineering, from the point of view of the basic components of composites, the manufacturing techniques of composites and the mechanical and in-service properties of the composite materials. This chapter will concentrate upon the areas of bridge engineering where these materials are utilised; their advantages over the more conventional civil engineering materials will be discussed. Areas where the material might be vulnerable if used in certain bridge situations will also be given. Design considerations relating to bearings are described with diagrams under the headings of articulation, loading, fixity, restraint, movement and rotation. Types of bearings are also described and comments are made relating to the choice of bearings. The installation and bedding of bearings is detailed and illustrated for different types of deck, while mention is made of inspection and maintenance for different bearing types. Bearing replacement is treated in some depth, dealing with jacking strong points, replacement sequence, jacking load, articulation, jacking operation, bearing removal and installation, grouting and dejacking. Ten diagrams and ten photographs follow, illustrating both problematic and good practice. The bridge accessories chapter considers parapets, expansion joints, drainage and waterproofing. Parapet containment levels, working width classes and impact severity levels are tabulated, followed by a mention of aesthetics and the risk assessment approach to containment. Parapet materials are described, prior to a description of design considerations. The common types of expansion joints are described, together with the design approach, drainage measures, detailing, and installation and maintenance. Bridge drainage is described with respect to abutment and retaining walls, carriageway, sub-surface, and the abutment shelf. A brief history of bridge deck waterproofing is presented, followed by descriptions of the types of waterproofing, detailing, and installation and maintenance. The protection of bridge structures is central to the operation of any transport infrastructure and bridge owners seek protection methods that represent an efficient use of the available funds whilst maintaining adequate serviceability. Investigations of deteriorated structures suggest that problems arise from design errors, errors in the materials specification or construction method employed, and poor workmanship or quality control. As a consequence protection methods should be an integral part of the initial design and materials selection, reflected in the quality of construction employed, and linked to planned inspection. Given the importance of water management good design should incorporate modifications that reduce the risk of unexpected deterioration whilst facilitating maintenance processes. At the same time the bridge engineer can select from a number of active and passive methods for protecting bridge structures including enclosures, coating systems, cathodic protection, and the use of corrosion inhibitors. The objectives of a bridge manager are to ensure bridges achieve their design life, remain open to traffic continuously and their risk of failure is always very low. These objectives are to be achieved sustainably and at a minimum lifetime cost. The chapter divides the subject into project and network level bridge management. Project level is concerned with individual bridges whereas network level deals with the management of bridge stocks. Project level management includes aspects such as inspection, testing, deciding maintenance requirements and appropriate prevention and remedial methods and monitoring strategies. Network level management includes estimating the rate of deterioration, the prediction of future condition using Markov chain models, planning optimal maintenance programmes, prioritising maintenance, and assessing the effectiveness of different maintenance strategies. Maintenance affordability, backlogs and long term plans are also discussed. The chapter also discusses some important techniques used by bridge managers e.g. whole life costing, probability modelling, risk analysis and sustainability assessment. With age, aggressive environment and steadily increasing traffic, bridge decks wear out their strength and durability, especially where design, construction or maintenance errors are committed. This chapter first analyses the major sources of material and structural degradation: mainly concrete deterioration, steel corrosion, excessive magnitude or repetition of applied stresses or strains, temperature level, fluctuation and non-linear diffusion. The principal types of cracks and weakened areas are shown and commented on. For material and structural appraisal, numerous powerful methods are presented, ranging from simply conventional to highly advanced, selected for each case after a thorough desk study and a detailed visual inspection. The last presented method illustrates the feasibility of permanent monitoring and active control of structural safety, approaching the performance of smart systems. Finally, the residual strength evaluation procedures are outlined for a potentially distressed bridge. They involve a well-prepared semi-probabilistic recalculation process, based on site investigation results and on the concepts of serviceability and ultimate limit states. The different types of inspection are described for the maintenance or acceptance of bridges, the former category comprising safety, general, principal, special and assessment inspections. Preparation, records, health and safety, access and good practice are touched upon, and the requirements for each type of structure are summarised. Good practice for inspection is discussed under the headings of structural appreciation, structural identity, structural disguise, accuracy, weather and photography. Inspection of different types of structure is described for signs of distress in reinforced concrete structures, leakage, hollow members, prestressed bridges, culverts, steel structures, corrugated steel buried structures, masonry structures and retaining walls. Assessment is introduced, providing the formulae for identifying whether a structure passes its assessment. The levels of assessment are described, followed by descriptions of preferred methods of analysis for reinforced concrete slabs, reinforced concrete beams and slabs, steel beams and reinforced concrete slabs, inverted T-beam decks, shear key and filler beam decks, single span brick arches, continuous brick arches, concrete post-tensioned beams or slabs, concrete post-tensioned box girders and steel box girders. Common structural problems are listed for reinforced concrete slabs, reinforced concrete beams and slab, beams, reinforced concrete beams, box culverts, prestressed concrete, halving joints, composite beams, filler beams, riveted beams, cast iron beams, steel beams, steel box girders, jack arches, brick arches and piers. Strength considerations of deteriorated reinforced concrete structures are summarised. A dozen techniques for obtaining additional strength from assessments are then each described in detail. These are realistic models, comprising global models and mathematical models. Global models are described under soil-structure interaction, surfacing, inclined neutral axis, bearing clamping, redundancy, composite action and bridge modelling following pier impact. Mathematical models are discussed under bridge decks and non-linear FE models. Maintenance of bridge structures has undergone rapid development over recent decades. New deterioration mechanisms have become evident as bridge stocks age, requiring new testing and remedial techniques. Bridges assets are of critical value to the economy, and demand maintenance with the minimum disruption to the flow of traffic. This chapter considers the techniques required for particular materials – concrete, metal and masonry. These include methods of repair and strengthening, with particular reference to those which have undergone rapid recent development, such as plate bonding.